The Big Iron Farm Show draws thousands of farmers and farm equipment-makers to a fairground in West Fargo, N.D. For many this year, concerns about crop yields have been eclipsed by worries about President Trump's trade policies. He's seen soybean prices fall by more than 20 percent. "On my farm, that's close to $150,000 that we have to make up," he says. 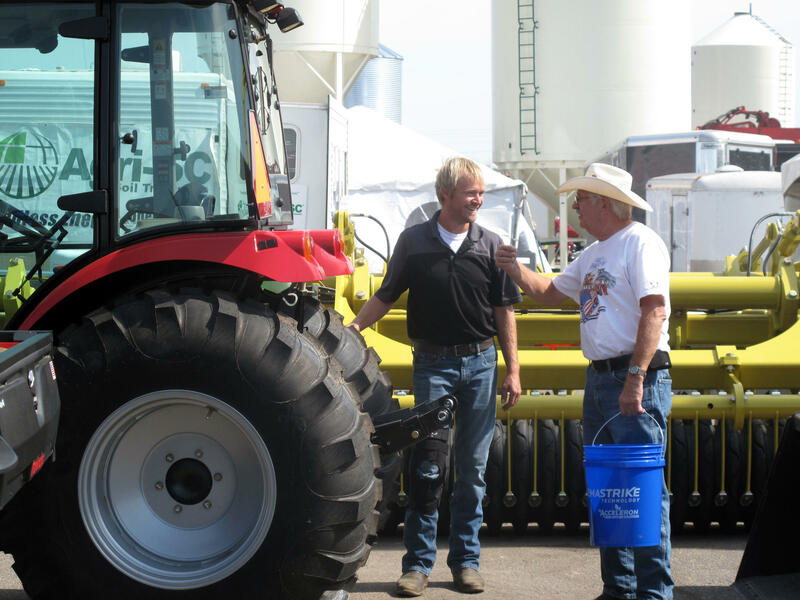 Johnson was among thousands who attended this year's Big Iron Farm Show in a fairground in West Fargo, an annual gathering for farmers to hear about developments in agriculture and check out the latest in threshers, combines and other equipment. This year, much of the discussion centered on the Trump administration's decision to slap tariffs on Chinese imports and the subsequent retaliation by Beijing, which has essentially ceased buying soybeans and other products just as the harvest is coming in. Prices for soybeans, the state's leading crop, quickly tumbled and haven't recovered. "We are now on the brink of a crisis in farm country that is completely policy-driven," said Democratic Sen. Heidi Heitkamp, who spoke to farmers Tuesday. "It's not being driven by weather. It's not being driven by bad farmers. ... We're struggling because we're getting bad policies," said Heitkamp, who's locked in a tough re-election battle against Republican Rep. Kevin Cramer. The loss of the Chinese market has been especially painful because North Dakota has staked so much of its future on Asia, where a growing middle class has developed a taste for grain-fed livestock. Soybeans and other crops are typically loaded on trains and shipped to the Pacific Northwest, where they're put on Chinese-bound freighters. Shifting to other markets isn't easy. "The challenge that we have is we have infrastructure built to go west. If you're a farmer east of the Mississippi, you have a lot better chance of finding a new market than you do if you're us," Heitkamp said. The drop in prices has placed many farmers in an uncomfortable dilemma: They can either sell their crops now at a loss, or store them and hope to sell them later if prices go up. "I can't afford to sell my soybeans at what would be $6.50 [a bushel]," says Dan Younggren, who farms 6,500 acres in far northern Minnesota. "So I've got to put them in the bin. How long do I have to leave them in the bin? I don't know. One year? We're even talking about maybe putting up another bin to keep beans for a second year. That's unprecedented." Like other farmers, Younggren hopes Trump will manage to achieve a trade deal with China, salvaging this year's harvest. But Younggren also worries that a trade relationship that was carefully cultivated over the years is damaged beyond repair. "It took decades to get these markets in place with China and whatnot. And the marketplace is not going to come back overnight. It's just not," he says. Younggren also says he understands the tough stance Trump is taking on trade. "Did something have to happen? Yes, it did. We want fair trade, along with free trade. China has not been dealing fairly with us, and it had to be taken care of. Perhaps it should have been started four administrations ago," he says. In a state that voted overwhelmingly for Trump, that's a view voiced by other farmers. "Our farmers want markets. So they want better trade deals and they recognize that the administration is trying to get these better deals," says John Hoeven, North Dakota's Republican senator. "In the short term that puts a lot of pressure on our producers, because they have to market a crop every year," Hoeven says. "So the challenge is getting these trade agreements done as soon as possible." All right. The start of the harvest season has brought a new concern this year for a lot of farmers in the Midwest. The Trump administration's trade policies have helped drive down the prices for all crops, as foreign markets such as China pull back on their purchases. NPR's Jim Zarroli is attending one of the biggest agricultural shows in the Midwest this week, and many farmers there are worried about whether these markets are going to come back. JIM ZARROLI, BYLINE: Each year, the Big Iron Farm Show attracts thousands of visitors to a dusty fairground in West Fargo, N.D. Dozens of farm equipment makers come to show off their latest products. Acres of threshers, combines and tractors gleam in the hot September sun. Among the farmers who turned out this year, the No. 1 topic of conversation has been the big drop in farm prices, especially for corn, wheat and soybeans - America's largest crops. CHRIS JOHNSON: Oh, it's a devastating loss. Soybeans are my largest acreage crop. ZARROLI: Chris Johnson farms 3,300 acres in the southern part of the state. Much of what he grows gets exported to Asia. This spring, the Trump administration imposed tariffs on Chinese imports. China retaliated, and soybeans were among the first crops targeted. Almost right away, prices fell by a fifth. It's a huge loss for Johnson. JOHNSON: On my farm, that's close to $150,000 that, you know, we have to make up. ZARROLI: And farmers here can't easily find other markets to sell to. The rail lines that transport crops head to the Pacific Northwest to serve the vast Asian market. With prices falling, farmers face a dilemma - do they sell off their crops now and take a big loss, or do they try to store them and hope to sell them later at a higher price? Dan Younggren (ph) farms 6,500 acres in far northern Minnesota. DAN YOUNGGREN: I can't afford to sell my soybeans at what would be $6.50. So I've got to put them in the bin. How long do I have to leave them in the bin? I don't know. ZARROLI: Like a lot of farmers here, Younggren is hoping that the current crisis is part of some negotiating strategy, and Trump is getting ready to announce some kind of new trade deal with China that will bring prices back up. But he worries that a trade relationship that was carefully cultivated over the years has already been damaged beyond repair. YOUNGGREN: It took decades to get these markets in place with these - with China and whatnot. And the marketplace is not going to come back overnight. It's just not. ZARROLI: John Snyder is with Hurricane Ditchers (ph), a small Indiana company that makes machines that smooth out drainage ditches on farms. The machines use a lot of steel, and the company already faces higher costs because of the steel tariffs. So far, it's managed to keep prices from rising. JOHN SNYDER: We're a luxury item. We're not a tractor or combine plant, or we're not a necessity. ZARROLI: But this is Trump country, and although people here are on the frontlines of the trade war, many people, like Snyder, believe the president is doing the right thing by taking on China. SNYDER: I believe in the administration and what they're trying to do. I just wish it would have started 40 years ago so we could have gradually gotten here. There's going to be a lot of suffering to get to where we need to be. ZARROLI: Ironically, this has been a pretty good year for farmers here. Crop yields have been better than average, but with their largest markets suddenly closed off, farmers are having trouble selling their bounty. And no one knows when that will change. Jim Zarroli, NPR News, Fargo, N.D.
(SOUNDBITE OF WHISKEY COUNTY BAND'S "SUMMER COUNTRY HITS") Transcript provided by NPR, Copyright NPR.